Hope you enjoyed the little April Fool's earlier this week! 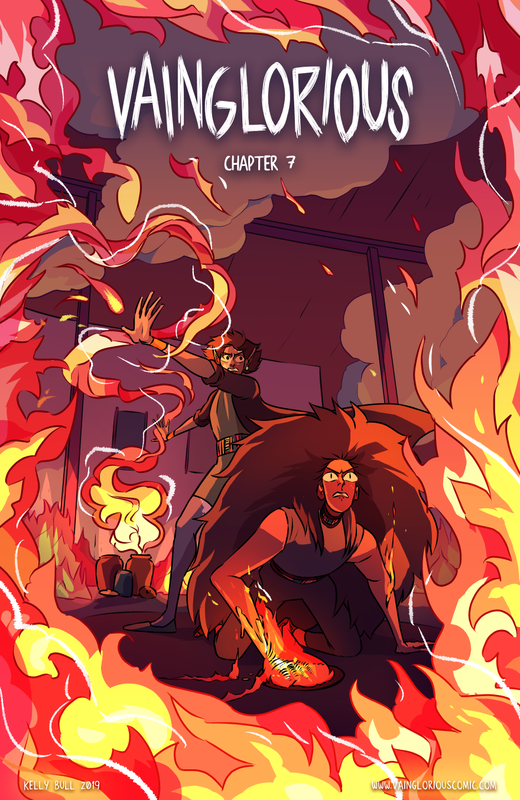 I had a lot of fun seeing people get fooled >:)c This is the real cover for chapter 7, which is a bit less fun for our cast this time around :C Both Rei and Von are trying their best though. I was originally going to resume updates April 8, but I'm going to have to extend that to April 11 (Thursday of the same week) since I've been planning for a convention this weekend, and that's occupied quite a bit of my time. So again, page 1 of this chapter will go up April 11. Apologies for the small pushback but thank you for your understanding! And for local Australian people, catch me this weekend at Melbnova in the Artist Alley, table #88! I'll be there selling zines, fandom merch, and some original prints! I haven't yet made Vainglorious merchandise but... how do people feel about little collectibles like acrylic charms or postcards? And maybe.... an online store? Also! I got a question from a reader that I want to extend to you here as well. Would you be interested in a Vainglorious Discord server? If it's something enough people want, I'll think about trialing a server for a bit. Let me know in the comments below! Thank you for reading and commenting! Hope you all have a great weekend and I'll see you next Thursday!